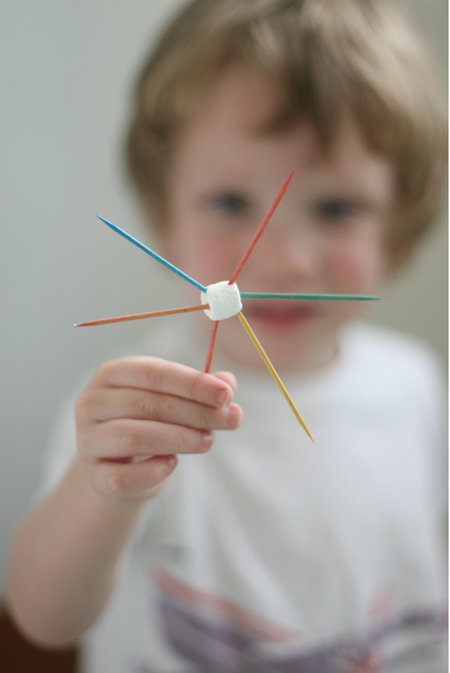 Rainbow toothpicks were used of course. 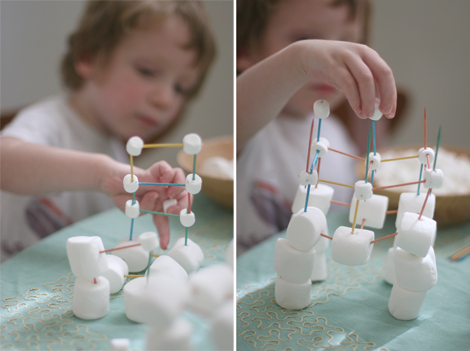 After we got sick of building structures we made a few simple shapes and then cooked up some rice krispies treats with the leftovers. Really fun. A little sticky and a yummy result. 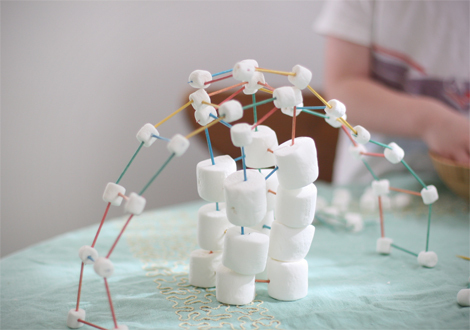 raw spaghetti noodles and marshmallows would be safer and you could break the noodles for different heights and sizes. 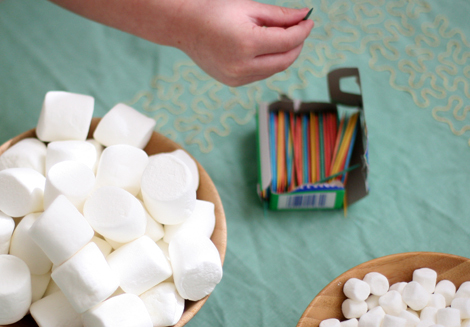 add using a little of colored water with food coloring with paint brush for the marshmallows let dry then eat. what a fun treat that would be. nice photography with that last shot! my boys would love this activity! I don't have kids… but I might just do this anyway! What a great idea! Lady, you are mad smart, and boy does that look like fun. I am saving this idea in my brain storage for future reference. Alicia, that app sounds like so much fun! I'll have to check it out. Thanks for the tip! Lori, that is so funny you've used this in school with older kids. It's quite challenging for any age! that looks like so much fun for everyone! That is a super cute idea! My little guys will LOVE it. What a creative rainy day you had! Absolutely love this idea. Definitely picking up toothpicks and mini marshmallows the next time I go to the grocery store! FUN!! Reminds me of the app I had on my Android called 'Spaghetti Marshmallows'. 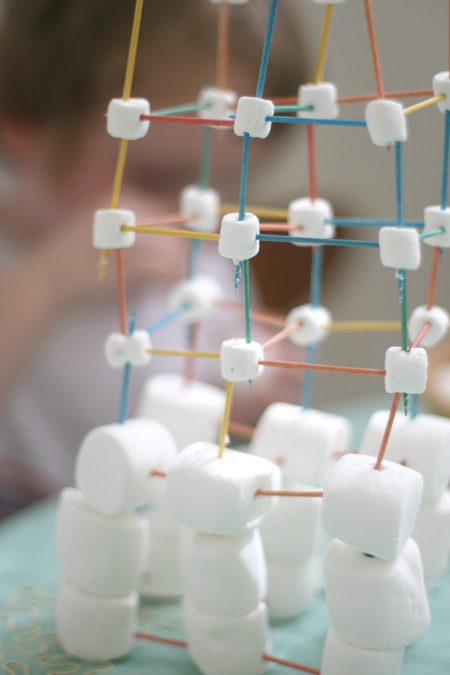 Premise of the game is to build structures out of a limited supply of raw spaghetti noodles and marshmallows to get a marshmallow through a ring. Hours of fun! This is too cute. Your photos are great and I'm definitely trying this with my 2-year old! 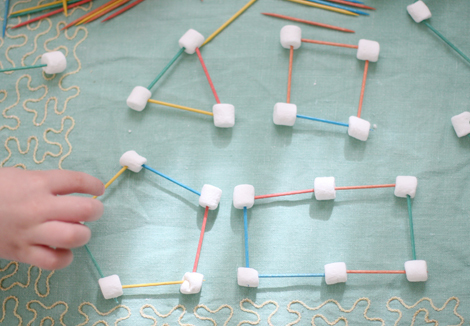 Wow, perfect rainy day kid craft! aw this looks so fun! love it! How cute, I've never heard of this! I have used this idea often as an after-school project specialist–it is fun to see some tough inner-city 12 year-old boys and girls really get into this. Hehe cute idea!Reminds me of my first week in uni, we had to see who could build the biggest structure out of wine gums and dry spaghetti! The first day was fun, the next two were just infuriating!